How would life be different if you could think, see, and do all things in light of the person and work of Jesus? With this inspiring collection of 365 Scripture-centered prayers, pastor Scotty Smith helps you pray the Scriptures through the lens of the gospel, mining the great resources of God's grace and applying them in every season of your life. No posing. No pretending. Just an honest, no-spin relationship with a God who claims you as his own. Each day includes a Scripture reference and an inspirational original prayer, born from moments of great faith and times of crisis. Like a modern-day book of Psalms, Everyday Prayers is a pathway to growing in grace that you will want to explore year after year. 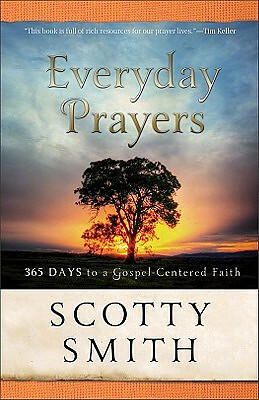 Everyday Prayers for a Transformed Life by Scotty Smith was published by Baker in October 2011 and is our 12424th best seller. The ISBN for Everyday Prayers for a Transformed Life is 9780801014048. Be the first to review Everyday Prayers for a Transformed Life! Got a question? No problem! Just click here to ask us about Everyday Prayers for a Transformed Life.